Perhaps you haven’t yet heard of ‘new latitude’ wines. These are vintages whose grapes are grown in places—usually tropical places—your French great-grandmother thought were good only for the exotic coconut, banana, and pineapple. 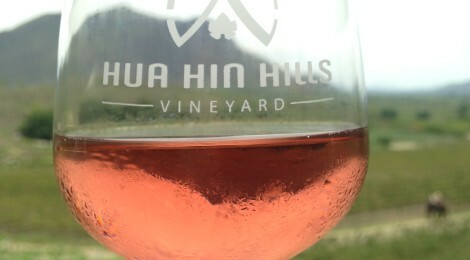 We travel the 45 kilometers to Hua Hin Hills Vineyard in a jolly twist of excitement, hilarity, arch-eyed doubt, and optimism. Isn’t this what our French great-grandmother would hope for us? To be revved up for a nice surprise or to tell the truth about a charade? Are those fields of pineapple we’re passing? Yes, really, pineapples. Is that a banana plantation? Yes, really, a banana plantation. Are those grapes? Yes, really, a vineyard. The restaurant’s roof line and grapes immediately surrounding the “Sala Wine Bar and Bistro.” We thought the grape leaves looked a little less verdant and a little more red than they look at latitudes closer to 45 degrees. Click the picture to enlarge. We don’t even take the winery tour. Shouldn’t we though? Shouldn’t we want to learn about all the crazy enforced dormant periods they put the plants through? Shouldn’t we want to learn about which temperate varieties do best just 12.5° north of the equator? Yes, but…we’ve been on a lot of winery tours. Fermentation isn’t new to us, we’ve seen a lot of barrels. We want to taste the wine. We’re in a food-mad country. We want to savor what they serve with their wine. We run strait to the restaurant. In our heads we try to say it like Alison’s French-Canadian great-grandmother: restaurant. This is not a halfway operation. The building is perhaps a hundred meters long, with a gracefully pitched, multi-tiered roof of tile: the architect did a breathtaking job of putting a strongly Thai style in a picturesque, rural setting. 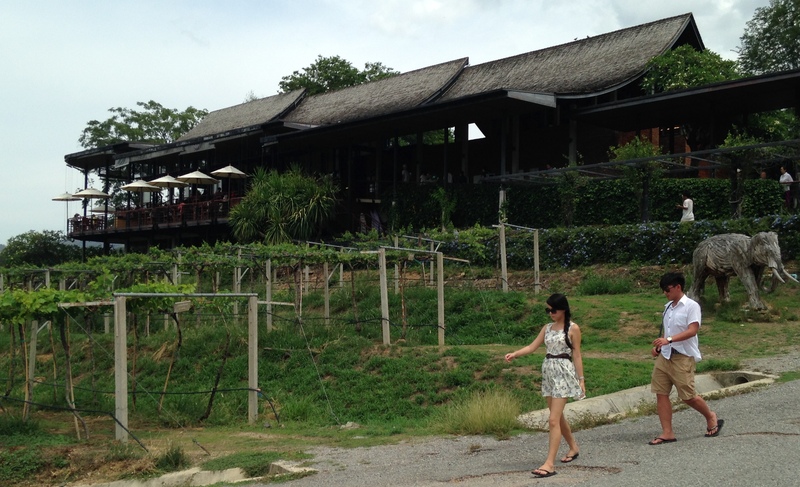 The building-long, wrap-around deck affords sweeping views of the grapes near at hand and the limestone hills surrounding. The staff are nattily dressed in black and white uniforms. The chairs and tables are a fine teak, not night-market plastic. Real stemware! Your place is set at Hua Hin Hills. The establishment does not try to borrow character from Europe. It is Thai through and through. Click the image to enlarge. We page back and forth in the menu excitedly as we await the arrival of our complimentary grape juice. Complementary grape juice? Part of this is true to culture: all over east Asia, from the Nepalese lowlands to the northernmost Japanese islands, the best hosts will greet their guests with fruit juice. Part of this is crafty marketing: you may sample the grapes without paying, but you don’t taste the wine without paying. 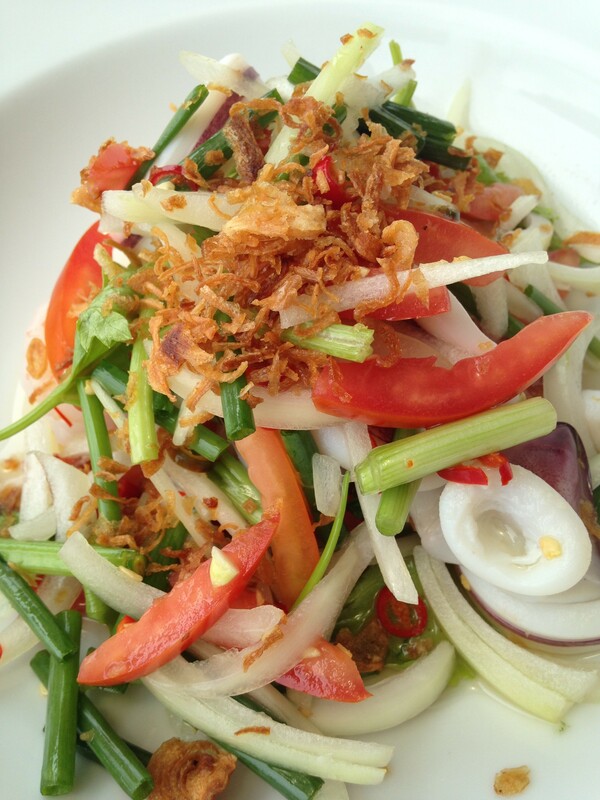 A classic Thai salad ready to pair with wine. Some of the wines did an especially nice things with the raw onions and the birds-eye peppers. Click the image to enlarge. Wine and food, in the European sense of the combination, is a relatively new thing in Asia, and the Hua Hin Hills people are taking their mission of educating their consumers seriously. The menu has tasting flights of wine. The menu has tasting flights of wine paired with tapas-like small plates. The menu has larger, individual pours paired with larger dishes. 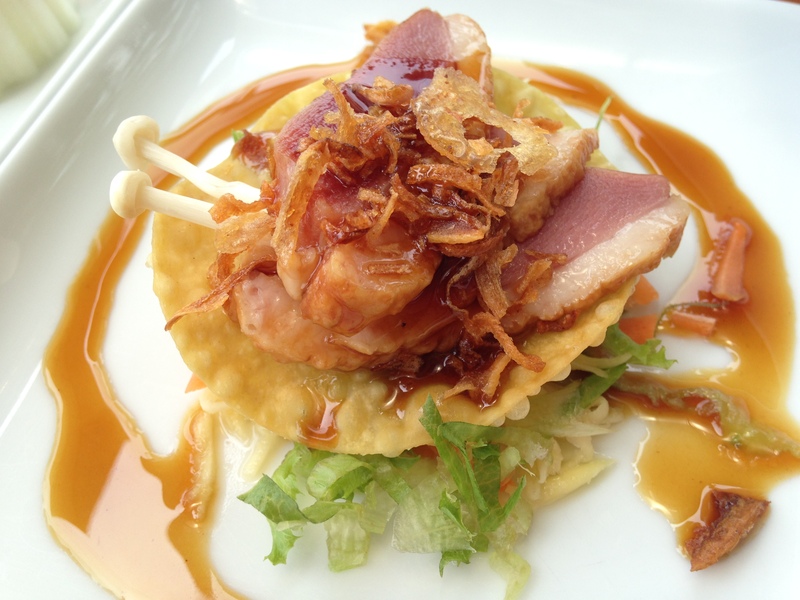 The menu also gives more sophisticated palates the option of making their own pairings. We do both, ordering the chef’s tasting flight of small pours and small plates, a second set of small pours, and some plates that we think ought to pair with the offered wines, which are primarily from French varietals. Great-grandmother! Is that an elephant parading through the vineyard? Yes, an elephant. 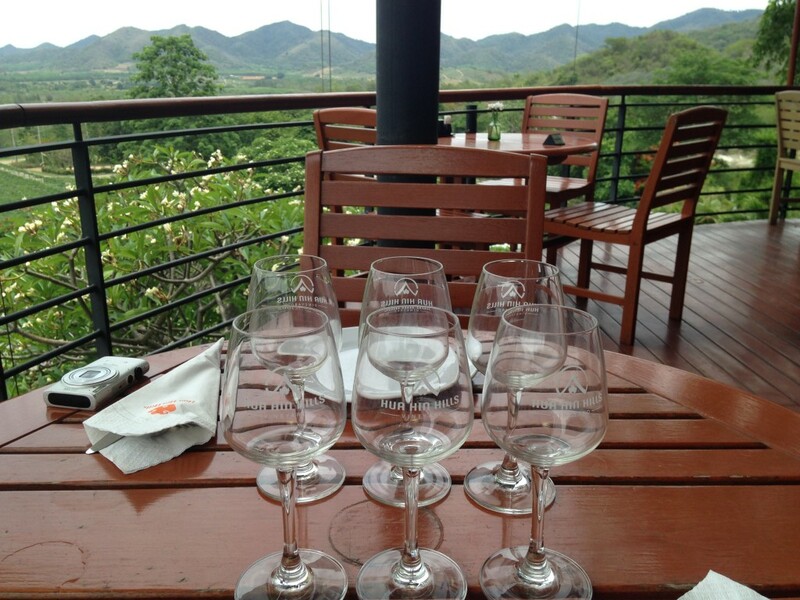 Hua Hin Hills has done an admirable job of copying the winery experience as defined by California and giving it Thai twists: one option is to tour the estate on the back of an elephant. The riders wave toward the restaurant. We wave back. What do we order? What do we try? Our first wine is a French colombard. It is paired with a green apple and crab timbale. Our second wine is a white shiraz, paired with a lobster tail set next to a frozen red curry. Our third wine is a purplish-red shiraz, paired with slices of smoked duck, whispery stalk mushrooms, and a tamarind nam prik. We supplement the menu with a spicy seafood salad (poached shrimp, mussels, squid, tomato, and various vegetables) and a seared sirloin salad with lemongrass, Thai spices, matchsticks of cucumber, and red grapes. At the end of the meal we spurge with two glasses of bubbly, one brut white, the other a sec rose. With the bubbly we have a cheesecake graced with a reduction of local grapes and a Chantilly cream. How does it taste? What do we think? Two Monsoon Valley bubblies. 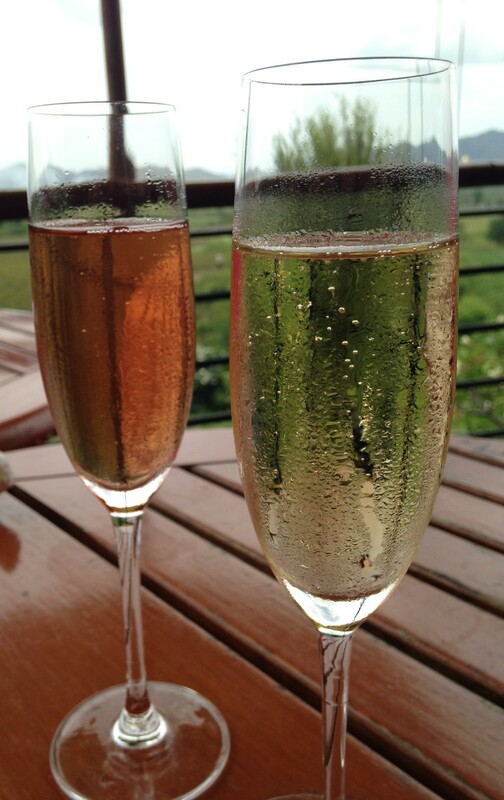 We predict that these will catch on with Thais, who already like drinks with bubbles. Click the photo to enlarge. There were interesting surprises in the pairings, some pleasant and some simply surprising. On the pleasant side, the French colombard was a really lovely match with the mussels from the seafood salad: a big bowl of shellfish—spicy like the Thais would have it or garlicky like the Gallic prefer—beside a bottle of that wine would be a happy day. On the simply surprising side, the same wine did not pair particularly well with the apple and crab timbale: we want attribute this to the quality of the apples used, which didn’t have a robust or sharp flavor that we think would suit the plate better. Could it be that the Thai chef was cooking with an unfamiliar ingredient to create an unfamiliar dish? Mon dieu! (Even your French great-grandmother would admit it.) That duck was fantastic! A little double-decker of smoked duck. The well-fried shallots atop the dish added delightfully to the flavor, and their texture was compounded by the rice-flour crisp beneath. Click the image to enlarge. Two wines tied for our favorite. The white shiraz—with its mineral character, its strawberry taste, and its long flavor that darkened on the tongue as it lingered—was excellent with the peppers, spices and strong acids of Thai cooking. The white bubbly, called Blanc de Blanc and no doubt a cuvee, was also very pleasing. Its character was more like an extremely dry Italian Prosecco than a French sparkler. It was great with dessert, teasing out some earthiness and nuttiness in the cheesecake. I liked your list of tags at the bottom of the article. Also, the image of an elephant in a vineyard was priceless! Look again at the article’s top image, the glass of rose. You will see a grey-brown smudge in the lower right of the photo. That’s the elephant, carrying riders.